Blackout lined curtain. Face: print polyester, and back with 85% blackout lining lined, so 2 layers create finally blocks out 95% of light and 100% of UV ray. Picture product is 52W*84L per panel. If you need multi panels match patterns,please talk to us for matching at top or bottom if necessary. 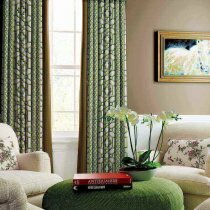 SOFITEL Collection: Focus on affordable contemporary home fashion design with grade 4.5 color fastness. For example, if you want a full look and your window is 64" wide, add 16" for pole or track installed.This allow the end panels to extend 8" beyond each side of window frame, reducing light gaps and maximizing privacy.If you want back tab/rod pocket heading in 1.25 ratio fullness,then single curtain width size should be 50" ((64+16)*1.25/2).You decide the fullness to create folds according to the different heading type you want. 1) For grommet,the inside diameter of grommet is 1.6 inches,outside 2.7 inches,and around 6 grommets every 40 inches wide curtain. 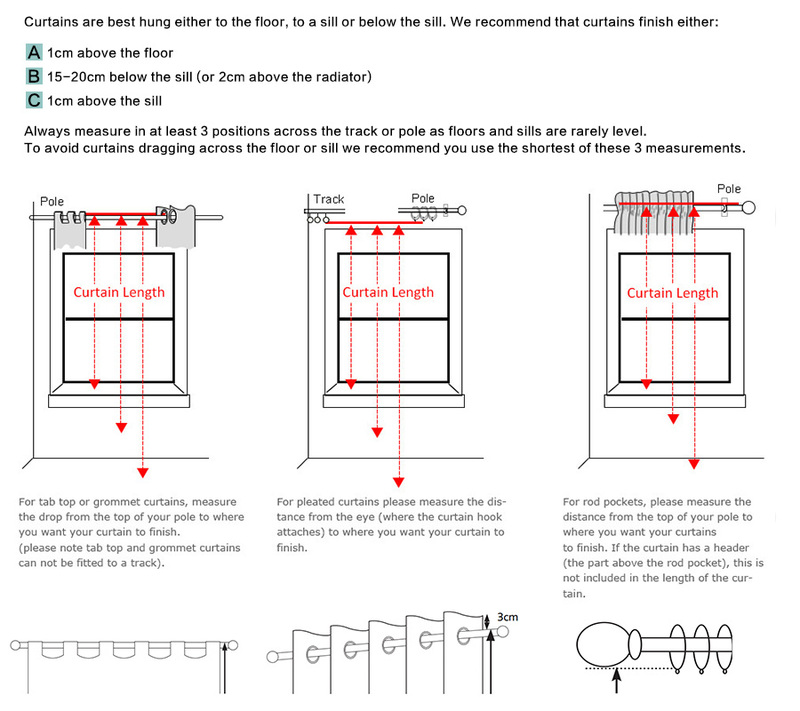 Measure the drop from the top of pole to where you want curtain to finish. 2) For tab top,the height of tab is 4 inches,and around 6 tabs in a 40 inch wide curtain. Measure the drop from the top of pole. 3) For rod pocket and back tab, come with 1 inch header,and the height of pocket is 3 inches to ensure rod could pass through. 4) For pinch pleat and goblet,there are around 6 pleats with firm adjustable plastic hooks in a 40 inches wide curtain. 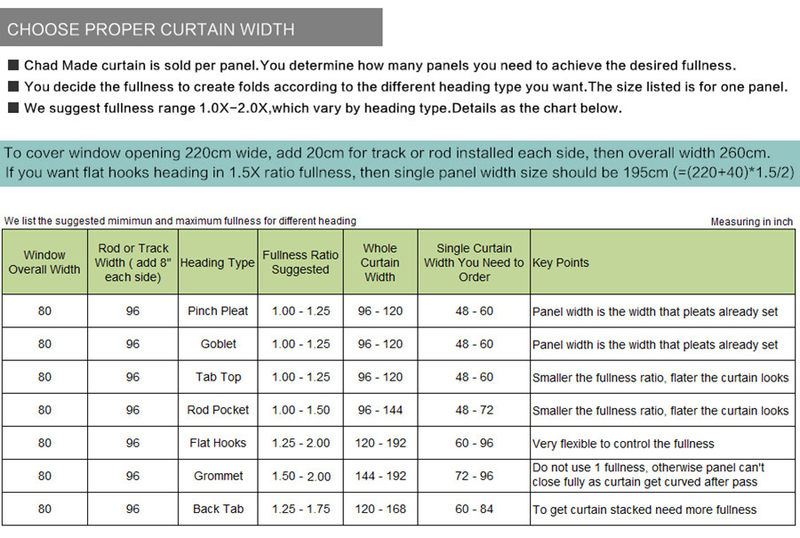 The panel width are the width that pleats already set in the panel.Measure from the eye ring where the curtain hooks attached. 5) For flat hooks,come with firm adjustable plastic hooks. Measure from the eye ring hooks.It could create folders without pleats. Very Beautiful and well made! Exactly as pictured and a pleasure to the eye. it is a very heavy material, blackout,PLEAS ENSURE YOU BUY A VERY STURDY RODS TO HANG THESE ON. DRAPES ARE VERY HEAVY. I love my new drapes. The quality is excellent and their customer service department is speedy to reply to emails and was very easy to deal with. The drapes arrived one week early than expected. What's not to like ?? Beautiful!! I’m so happy with these drapes. They are much richer and heavier than I had hoped and hang beautifully. The colors are subtle and perfect autumn tones for my mountain home. I sent them back because they were not quite right for us, but...they are gorgeous! The return was super easy and fast. Absolutely beautiful! 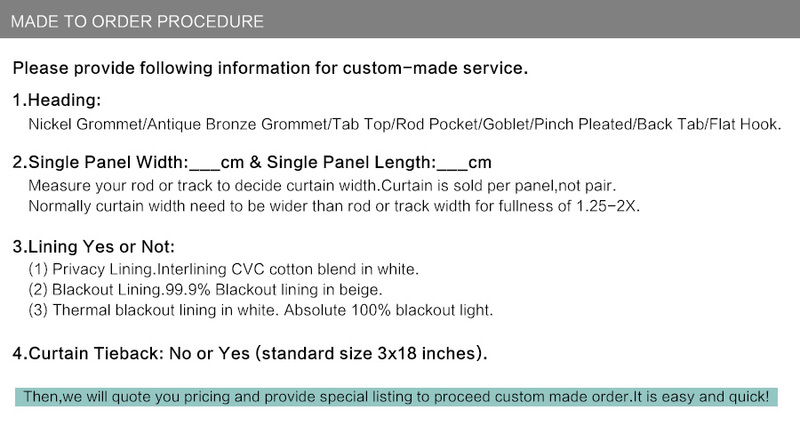 They emailed me directly to confirm size and grommets, and once confirmed my curtains arrived in just a couple days! They are backed and even with such a light color, will block out most of the sunlight. Photos taken mid-day with full sun. One with lights on. Blinds are nearly complete blackout and I am able to sleep better during the mornings. The material is perfect and the design is beautiful! So pleased with these drapes, wonderful pattern, it just changes the entire ambiance of whatever room you put them in. Beautiful, they are a heavier drape but I am glad I purchased them. They are not blackout but a good thermal one. 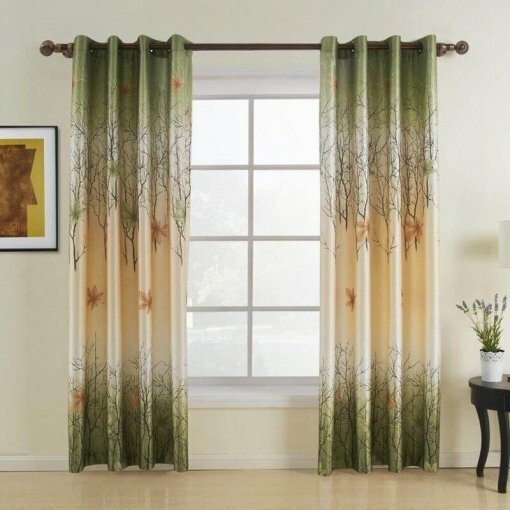 Very beautiful curtains. Luxury and high quality. They changed the grommets to brown for me. The email conversation was smooth. Very happy with the purchase. It is beautiful, I will enjoy it for many years to come. I ordered one for my patio door and one for my window. 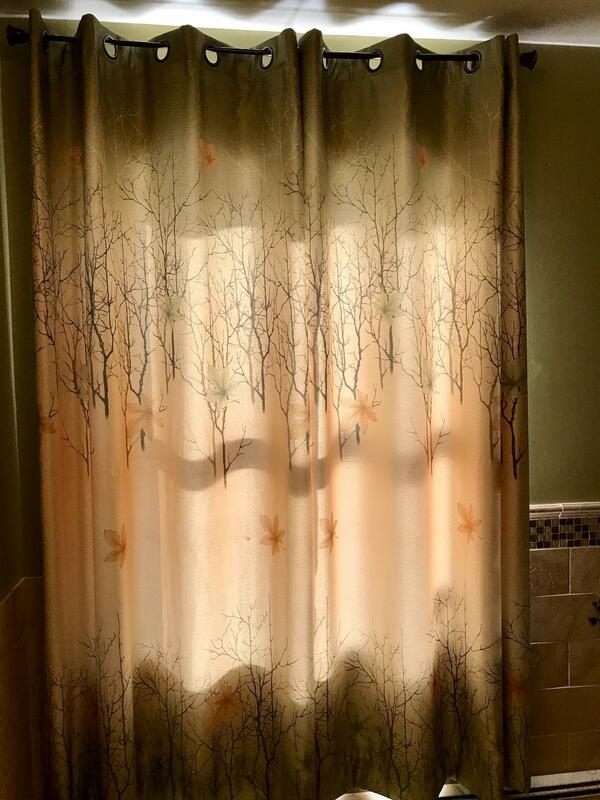 These curtains are beautiful. So well made, gorgeous material and quality outstanding. My new room turned out so nice......thank you Amazon and ChadMade! 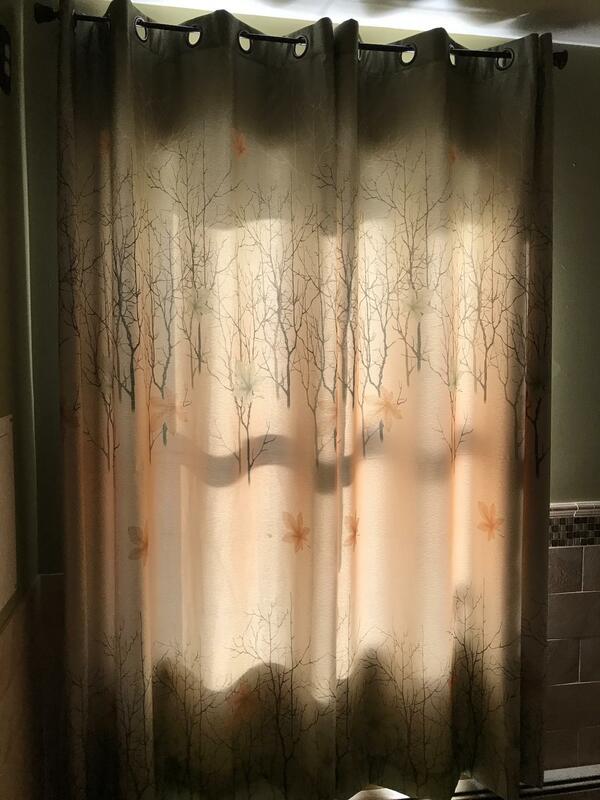 I love the print, but then I love bare trees in the winter, which the curtains depict quite well. Then I change out the curtains for the spring with fully leaved trees. One panel works very well on a standard window, which enables one to see the print. And the sun blocking works very well.